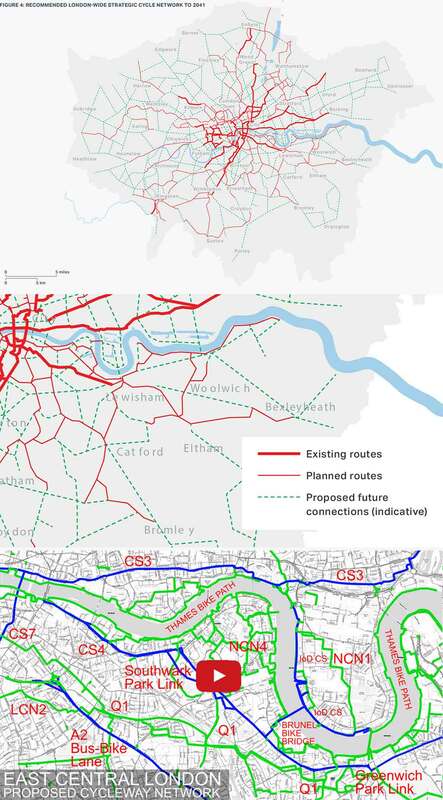 The 2018 MTS plan for a Londonwide Strategic Cycle Network (top) is very welcome. But the detail of SE London (centre) shows that it is not even as fully thought-out as my 2016 ‘back of an envelope’ plan for a Cycleway Network in SE London. Seven of the problems with the MTS-LSCN plan are (1) we would have to wait till 2041 to get it (2) the plan is profoundly un-ambitious (3) the plan does not follow the principle of providing superhighway-standard cycleways on most of the TLRN Red Routes (4) the plan is only for a ‘recommended’ network, without either a funding plan, a phasing plan or a benefit cost analysis to support the case for investment in cycle infrastructure (5) the plan is based on a demand survey (of ‘cycling potential’) and does not use supply side data (on where cycleways could/should be built) (6) the plan includes discredited quietways based on the So-Called London Cycle Network LCN+, and I guess the mayor plans to build even more ‘quietways’ as indirect backstreet routes which are too indirect for commuter trips and too unattractive for leisure trips (7) here is an example of the incompleteness of the MTS plan: it does not include Lewisham’s excellent plan for making the A20 both a healthy street and a superhighway-standard cycleway. Conclusion: it’s great to have the MTS-LSCN but IT’S NOT GOOD ENOUGH. commuters require short fast routes. Since these will very often be Red Routes, most of TLRN Red Routes should be re-designed to accommodate segregated cycle lanes. investment in London cycle infrastructure should be related to the target mode share for cycling as a proportion of trips (eg 10% of London’s transport £10bn/year budget should be invested with the aim of increasing the mode share of cycling by eg 10%/year. Mode share targets need to be discussed with the London Assembly and put out to public consultation. Commuter Cycleways should be the shortest paths from origins to destinations. Leisure Cycleways should go through attractive environments. Recreation routes can be linear or loops. They should be linked to Commuter Cycleways and available for dual use, as feeders to TfL’s Strategic Cycleway Network. work on the quietways should be discontinued. They are not direct enough for commuter use and they are not attractive enough for leisure use. See review of Quietway 1. Conclusions: (1) TfL’s plan for a strategic cycle network is a welcome start on providing London with a sustainable mass transit system (2) the MTS-LSCN looks like a rush job and is not good enough (3) too little work has been done on the necessary survey, analysis, planning and design work (4) the funding, budget and phasing proposals are totally unsatisfactory (5) please see links to 18 video reviews of cycle infrastructure in SE London for additional commentary (6) TfL should make more effort to involve local cycle groups in cycle infrastructure planning (7) I see no reason to make London cyclists wait 23 years for a half-decent cycle network that could be built in 22 years or, better, in 2 years.